ModTest is an automated test program that enables you to develop and run test suites for Modbus devices. Using ModTest, you can define commands together with their expected results, and send the commands to a Modbus slave. ModTest will automatically compare the actual results from the slave with the expected results, and flag any differences as test failures. 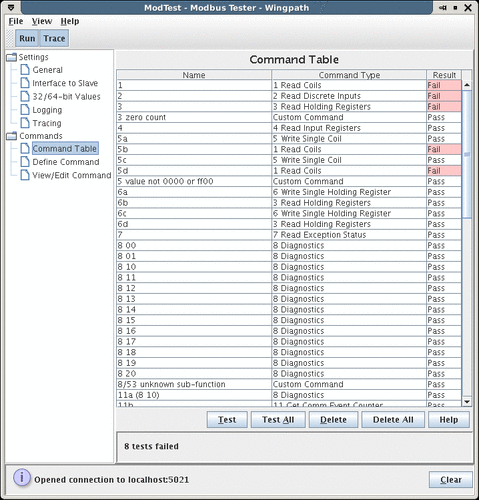 The commands can be saved and used as test suite for initial development of a slave device, for production testing of devices, and for regression testing of device modifications. Informative tracing of all Modbus messages sent and received providing interpreted data to aid understanding. All data that is sent or received may also be traced as raw data (in hex). 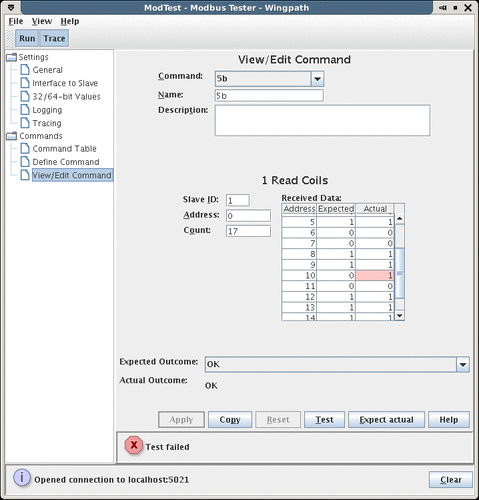 Logging to a file, or a window, of tracing and diagnostic messages. All configuration settings may be saved to and restored from files, in XML format. All known extensions of the Modbus protocol for handling 32-bit and 64-bit integers and floating-point numbers are supported (including Enron/Daniel Modbus). Full support for exception responses 10/0x0A ("Gateway Path Unavailable") and 11/0x0B ("Target Device Failed To Respond"). You can download the complete version of ModTest for a free 3-day evaluation period.